Hellboy (Ron Perlman) and his team face off against a new supernatural threat, while Professor Bruttenholm (Sir John Hurt) must investigate the possible reemergence of a vampire he had slain decades prior. Hellboy travels to Japan to fight an ancient demon. At the request of a priest, Hellboy travels to an abandoned castle in Ireland to battle a variation of a redcap. 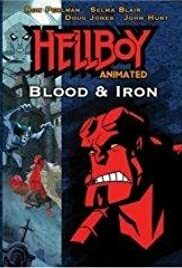 In-depth documentary about the history of the Hellboy comic book, the history of the character and the making of the 2004 movie adaptation of the same name. Two stories featuring Marvel's anti-hero The Incredible Hulk and his encounters with the X-Man Wolverine and the god known as Thor. A Civil War-era secret agent with an extraordinary special power serves under president Abraham Lincoln. Erzsebet Ondrushko: The years have not been kind to you. Professor Trevor 'Broom' Bruttenholm: Nor you. Erzsebet Ondrushko: So frail. Time has turned you to glass. I pity you. Professor Trevor 'Broom' Bruttenholm: And I you. Growing old is not the worst fate that can befall a person... but you ceased to a be a person long ago.